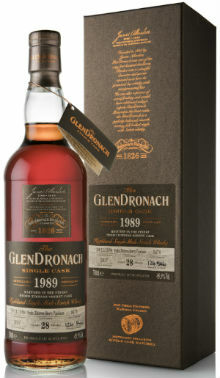 Every few months since mid-2009, Glendronach have released a new batch of single cask bottlings. 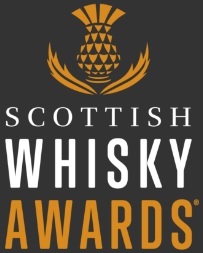 Each batch is more hotly anticipated than the last, given the distillery’s now-rock solid reputation for producing stellar heavily-sherried whiskies. 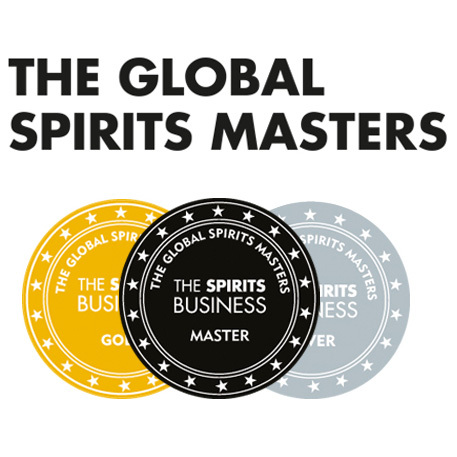 Many fans were concerned, quite rightly, that a change in ownership from Billy Walker and co at the Benriach Distillery Company to Bacardi Brown-Forman would result in the single cask releases being dropped. However, with that deal being old news, and 15 new single casks hitting the market last month, it looks as though they’re here to stay… for the moment at least. We have a little trio of whiskies from this batch on the blog today, with one from each of the past three decades, and all three have been matured in ex-Pedro Ximinez sherry puncheons. Better get to in then, huh? Nose: Orange blossom, candied pineapple, wine gums, toffee apples and charred cranberries are underpinned by chocolate orange, buttered toast and dry twigs. Palate: Big and spicy to begin, with cinnamon, black pepper, toasted currants and salted caramel. Then there’s cinder toffee, singed orange peel, honey, cask stave and lots of big, grippy, drying tannins. Finish: Dark chocolate with bitter orange zest and some cloves. Nose: Rum soaked raisins, hazelnut pralines, glazed walnuts, prunes, syrup of figs, spiced mango chutney and even a touch of HP Fruity Sauce. There’s also black tea, charred logs, and some faint, old, dry leather. Palate: Big, rich, and mouthfilling. The leather is back with some firework – just a hint of sulphur. Molasses, cola cubes, Morello cherries, plum, cigar ends, dark chocolate and cask char. Finish: Dark chocolate, black tea, cinnamon and some prune-y sweetness. Nose: Afternoon Tea! Millionaire’s Shortbread, strawberry jam on fruit scones, coffee liqueur chocolates, Black Forest Gateau and faint espresso. Some nutmeg and pepper, faint bonfire char, and well-kept mahogany. Palate: Well done toast with orange marmalade, slightly burnt raisins, cherry loaf, toasted walnuts, Danish pastries and sherry soaked raisins. It’s very wood driven though, with a whack of clove, cinnamon, and heavy, drying tannins. Finish: Black tea, blackberries, orange liqueur and cask stave. Overall: Three very different, but equally enjoyable whiskies. 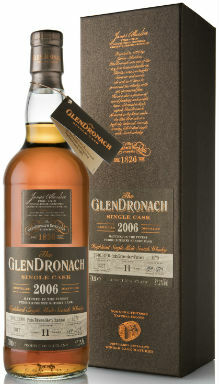 The youthful brightness and light fruit of the 2006 11yo is simple, yet satisfying, whereas the two older whiskies really showcase Glendronach’s expertise in maturing spirit in ex-sherry casks over a long periods of time. 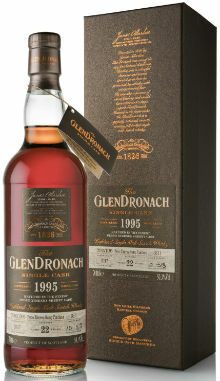 The 1995 hits the spot for me – with great balance between spirit, sherry and wood. Juicy, rich, spicy, sticky and sweet. Delightful. I did enjoy the 1989 too, but it’s close to, perhaps even slightly past, being too long in the cask. The tannins take over with firm wood spices readily apparent, and some burnt/bitter notes just take the edge of what could be quite a stunning whisky. Having said that, it’s still a great dram. Here’s hoping this isn’t the last hurrah for the Glendronach single cask batches as Brown-Forman look to make their mark on the distillery. This entry was posted	on Thursday, April 12th, 2018 at 11:33 am	and is filed under Reviews. You can follow any responses to this entry through the RSS 2.0 feed. You can leave a response, or trackback from your own site.